● Salmonlella and shigella infections. 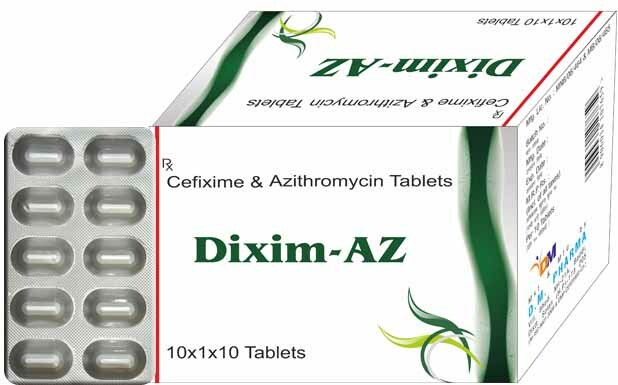 A new combination of cefixime and azithromycin is used for the treatment of upper and lower respiratory tract infection.Cefixime, an antibiotic, is a third-generation cephalosporin like ceftriaxone and cefotaxime. Cefixime is highly stable in the presence of beta-lactamase enzymes. As a result, many organisms resistant to penicillins and some cephalosporins due to the presence of beta-lactamases, may be susceptible to cefixime. Whereas Azithromycin due to it's long half life, which enables once daily dosing and shorter administration durations, is a property distinct from other macrolides. Elimination: Biliary excretion of azithromycin, predominantly as unchanged drug, is a major route of elimination. The Half life being 68 hours. On the other hand, like other macrolide antibiotics, azithromycin inhibits bacterial protein synthesis by binding to the 50S ribosomal subunit of the bacterial 70S ribosome. Binding inhibits peptidyl transferase activity and interferes with amino acid translocation during the process of translation. Its effects may be bacteriostatic or bactericidal depending of the organism and the drug concentration. ● Diarrhea that is watery or bloody. ● Chest pain, uneven heartbeats. ● Nausea, stomach pain, low fever, loss of appetite, dark urine, clay-colored stools, jaundice (yellowing of the skin or eyes). ● Severe skin reaction - fever, sore throat, swelling in your face or tongue, burning in your eyes, skin. ●Carbamazepine: Elevated carbamazepine levels have been reported in postmarketing experience when cefixime is administered concomitantly. Drug monitoring may be of assistance in detecting alterations in carbamazepine plasma concentrations. ●Warfarin and Anticoagulants: Increased prothrombin time, with or without clinical bleeding, has been reported when cefixime is administered concomitantly. Although most antibiotics probably do not affect hormonal birth control such as pills, patch, or ring, some antibiotics may decrease their effectiveness. This could cause pregnancy. Examples include rifamycins such as rifampin or rifabutin. Be sure to ask your doctor or pharmacist if you should use additional reliable birth control methodswhile using this antibiotic. ● Because azithromycin is principally eliminated via the liver, caution should be exercised when azithromycin is administered to patients with impaired hepatic function. ● Take this medication by mouth, with or without food. You may take this medication with food if stomach upset occurs. ● During pregnancy, this medication should be used only when clearly needed.